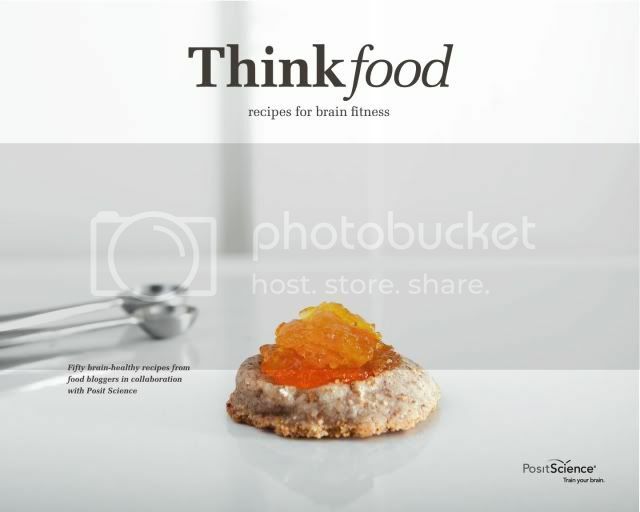 This past summer I was asked to contribute a recipe to the Thinkfood Cookbook published by Posit Science. I was thrilled to be invited to participate and had so much fun working on the project. One of the highlights of the whole experience was hearing from a Posit Science contact that while out at a dinner in the Bay Area, she was discussing the cookbook with her dinner companions when she was interrupted by someone at the table next to her. The woman wanted to tell her that she had heard about the Thinkfood cookbook from a blog she reads, Apples and Butter (I would love to know who you are if you are still a reader!). So many great things have happened as a result of this project, but I do not think anything could match the thrill of seeing the published cookbook for the first time a few weeks ago. It is a beautiful book, filled with delicious and brain-healthy recipes. I would tell all of you to head over to the Posit Science site to order your copy today (which you should all do), but I am more excited to tell you that I have one copy to give away here today. I created the recipe included in Thinkfood for my boyfriend. I was trying to satisfy a craving for a dish he had enjoyed many times in England with his father when he was growing up. We could not find proper lamb kofta in Los Angeles so I came up with this recipe to appease him until we made our next trip to London with his family. Have you ever had to recreate a dish at home for someone you love, in an attempt to satisfy their food craving? Were you successful? Tell me about your story in the comment section and one reader will receive a copy of the Thinkfood book, lovingly shipped by yours truly. Bonus points if you are willing to share your recipe so we can try it out on Apples and Butter! 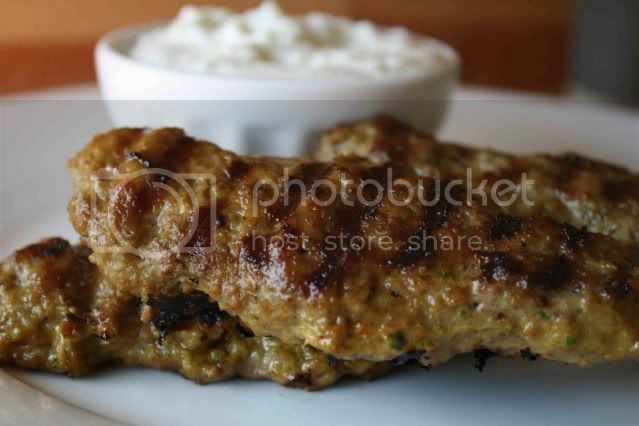 In the meantime, the original recipe for lamb kofta can be found on the Thinkfood cookbook page. If you stopped by today as a result of the Posit Science newsletter, thank you for visiting and please leave a comment with your recipe story so you can have a chance at winning the cookbook! I have tried to recreate a dish that my husband's mother prepares masterfully! It's called "salad reinforcement" and is a typical dish of Naples during the Christmas period. You cook the cauliflower in salted water, then cut into small pieces and dress with strips of pickled peppers, black olives, capers and parsley. Then you have to season it with salt, oil, a little vinegar and black pepper. I was missing the main ingredient that are "pepaccelle", that is made of small round peppers in vinegar, but also with normal peppers I must say that I succeeded quite well! My wife's comfort food is one of her grandmother's dishes that she calls "pot pie." After asking her grandmother how she does it, I recreated a vegetarian version that my wife raved about. My boyfriend's mom makes the best cheesecake which means that he thinks that most cheesecake will taste as lovely as his mother's. I've made cheesecake for him before but it never turns out quite as good. Practice makes perfect! And in the meantime...cheesecake cheesecake cheesecake! My husband would definitely be a better candidate for this question. Loaded with food allergens myself he works very hard to appease me with dairy and gluten free pizza, ice cream, and even my favorite mashed potatoes. He is a catch, what can i say. It looks like Lamb Kofta might make an appearance on our table! Oooh! How exciting to have your recipe published in such a beautiful book! I created a dish one night for my husband after he described it to me. In fact, I even wrote a blog post about it, with a recipe (since it was a hit). After Rob proposed I was gifted with about a dozen family recipes including his grandmother's famous braciole. Now, she is 5'2" or so, and I am 5'11", and most of her measurements include handfuls and pinches, so it took a while but I finally got it right. I knew I had it when he got genuinely upset when I packed up some leftovers for a friend after making Sunday Sauce. Victory!!! My husband used to think his mom made the best mac 'n cheese. He was craving it once and I made him my version and he was hooked! The difference - my starts with a thick cream sauce then get's put in the oven where as with hers no sauce is made. Also, I grate my cheese and she used pre-grated. Congrats on the recipe in the cookbook! So exciting! I was an interloper at a cooking school in Provence - there only for a few hours but while I was there I met the man of my dreams and ate a Tomato Gruyere and Nyons Olive tart that I still can taste today. The man I met is now my husband and we have recreated that tart to the point of perfection! My Mom is a diabetic so I often try to recreate some of her favorite deserts by using splenda instead of sugar. My husband loves meat and heavy dishes. He's a big fan of big food by Mario Batali. I've googled quite a few of his recipes and put them together - recently adapted his vinegar guinea hens to cornish his with pomegranate vinegar. It was a hit. Last night, I made paella for my Dad's birthday. For years, he's been talking about a paella that he had in New York about 30 years ago, which he still craves. The problem is that paella is one of those dishes that everyone prepares differently, and everyone decides that one particular way is perfect and that nothing else will ever compare. I have to say, though, that last night's version was pretty darn good. at some point. (Realistically, it might not be up until around the 20th. I have tried to make meat dishes for my husband with indian spices such as cumin , ground coriander , and turmeric . He liked how it turned out and I could eat it too since it was made with all the non spicy spices . I made it with onions , salt , black pepper , ground coriander , onions and then the veggies of any kinds such as potatoes , tomatoes , and last goes in the meat ! So it is a meat stew or soup . i signed up for the newsletter specifically in anticipation of your recipe being featured...and have loved the recipes. i thought i had to wait for your recipe to be featured in the newsletter and hadn't seen it yet (just got the curry grilled corn soup the other day), so pardon my delayed reply. i'd LOVE to win the cookbook but am really in a win-win-win situation...love your blog, love the posit recipes, and if i win the giveaway, would love the cookbook, too! hope culinary school is treating you well...you're living one of my "bucket list" dreams! way to go for it!! Definitely one of the best blogs I have come by for recipes! I hope the outcome is just as good on my end since cooking is a challenge along with playing golf! i don't have the capability as yet to recreate a dish! hopefully next time i may be able to! Yes I do!! Teriyaki salmon 'bake'! My mum and I lived in japan since I was born till I was 15, (I'm now22). Here in England, sometimes we decide to cook Japanese. My mum, however, being Philippine, tends to rely on me who schooled in Japan, to cook Japanese. So one day I decided to make a humble teishoku of the holy Japanese trinity: Soup, okazu(meat or fish with vegetables) and rice. Glistening sweet soy salmon in a stoneware was a discovery. Frying teriyaki salmon hardens its skins and loses its moist silky texture. This version bakes the fish in its own caramelising juices. It is healthier, and less hassle. Just take the dish to the table, warm. It is also great for a crowd. A dish that fits the salmon snugly together. Pour in everything into the dish (except spring onions) and with your hands, make sure the salmon is well coated in the sauce, then arrange skin side down, snugly in dish. Put under a preheated grill for 13-15min, or until the salmon is cooked through. Check with a fork for any translucent bits. From time to time, tip the dish to one side, collect and spoon over juices over the top. Do not turn fish over. Fry the spring onions swiftly in sesame oil, add a dash of soy sauce and pour over the ready dish. Scatter sesame seeds if this all seems too simple. Serve with fluffy sushi rice, miso soup, and if you can some lilted spinach: lightly squeeze out its water, mingle with personal amounts of tahini, sugar and soy sauce(go easy on the soy sauce if it is a salty type). I personally use 1tbs of the trio. Teishoku days are happy days. A friend and I went to Paris and had this amazing chilled clementine soup for dessert. I begged for the recipe but the chef would not budge. This soup was a perfect balance of cold, sweet, slightly tart, and so very light. We planned to go back before the end of our trip but never made it. With all the amazing food/desserts (with the exception of my daily macaron-okay macarons), that was the one that we couldn't get out of our minds!Six months later, I had a dinner party for my friend's birthday and wanted to make her this soup as a suprise. I emailed and called the restaurant in Paris to see if I could get the recipe but to no avail. Here is my version of that soup- I think it's pretty close to the original. Clementine Soup-6 clementines and 6 tangerines juiced-juice of one lemon-4Tbs.sugar-pinch salt-1tsp. cornstarch-3Tbs. orange/rosewater. for 5-6 minutes till sugar is dissolved and soup has thickened slightly.Take off heat and cool. Refridgerate overnight and serve super chilled with a dollop of creme fraiche! Voila! You will love this. Alot. Btw, do you think you can you hook me up with that Thinkfood cookbook? Thanks! Everything looks delicious here including your lovely site! Brain food, I like the idea! I like your blog. I'm also an avid cook myself. My kofte receipe is with well ground spring lamb, grated onions, panko bread (wetted in milk), sweet pepper paste, cumin, salt & pepper.